Eczema is not contagious. The cause is not known. It is likely caused by both genetic and environmental factors. 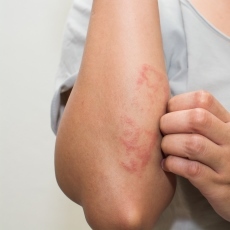 Eczema may get better or worse over time, but it is often a long-lasting disease. People who have it may also develop hay fever and asthma. The most common type of eczema is atopic dermatitis. It is most common in babies and children but adults can have it too. As children who have atopic dermatitis grow older, this problem may get better or go away. But sometimes the skin may stay dry and get irritated easily. Article: Oral H1 antihistamines as 'add-on' therapy to topical treatment for eczema. Article: Probiotics for treating eczema.